Today as I rode another morning bike commute in the cold dark of winter I noticed that the grass on the side of the roads was finally dying out. Usually the weather does not get cold enough on consecutive days down here to kill off grass and weeds. After several days with the temperatures dropping well below freezing the grass is finally turning brown. Today at my house the outside temperature at 4:30 AM was 29 degrees. I decided to suite up with an extra layer of leggings to keep my thighs from turning red after the 25 mile commute. I also added an extra layer by wearing my Cabal sweater under my long sleeve PCP jacket. I topped this off with my favorite winter jacket, the Shower Pass Elite. The lowest temperature recorded on my Garmin was 22.7 degrees. It always gets the coldest right before the sun comes up. I am usually towards the end of my commute when the temperature drops to the lowest of the ride. 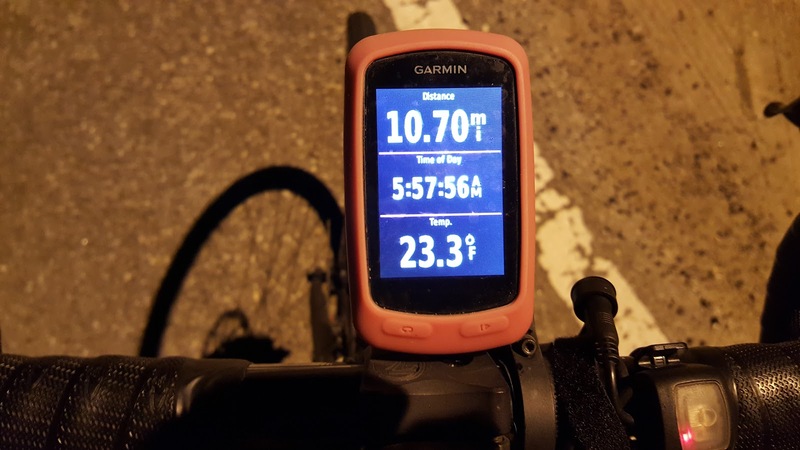 I stopped to take a photo of my Garmin this morning and I remembered my summer ride to Florida where I was trying to take a picture of my Garmin with 100 miles and 100 degrees temperature at the same time. this morning I rode 25 miles in 25 degrees. What an extreme between summer and winter riding. I am riding a lot slower when it is really cold (for me). It was not windy this morning, but I was steadfast in my resolve to ride to work and enjoy the time on the bike. One thing that I want to make note of is that my brake fluid in my rear brake froze up today. Matt Cole of Podium Multi Sport verified with me that my rear brake does not have a mechanical problem, but when ti gets cold the fluid inside of the brake housing will freeze up. This happened to me last year two miles from my house and my rear wheel locked up. I had to walk home carrying my bike, not a pleasant experience. Matt suggested that I carry a small butane lighter to warm it up if it happens again. This morning as I approached Leary road from Eight Mile Road I was applying my brakes and I noticed that my rear brake lever was stiff. I did not force it as I did not want to have a locked wheel 10 miles from my house with the weather this cold. I will have to remember to stop by a store and buy a lighter on my way home just to keep in my bag in case I do lock up my wheel when it is this cold. Seems like when the temperature drops below 25 degrees my rear brake stops working. ← Legs of Summer in February?